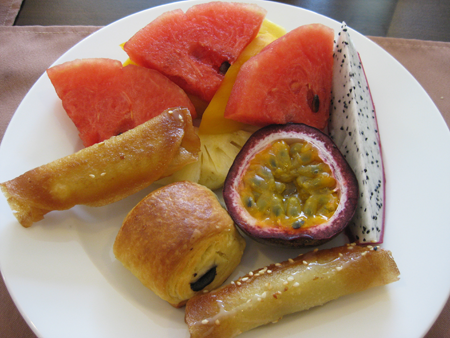 Sitting in my chilly home in Seattle with the rain pouring down outside, it nearly kills me to look at this photo of a fresh fruit breakfast that I enjoyed in Vietnam just a few weeks ago. You obviously recognize the watermelon (of which I think I missed only 2 days during my 5 week journey) and pineapple. But what are those other fruits? The dotted white one is dragonfruit, a delicious southeast Asian treat that kinda has the consistency of a pear and the yellowish one with seeds is a passionfruit (eaten by scooping out the insides with a spoon). I couldn’t pass up the pastries which included a couple of banana rollups and a chocolate croissant.